-New List View Buttons, to enable your users to merge directly from the List Views or Search Results. -Other minor changes and improvements based on feedback from our clients, and we appreciate this, so keep them coming. 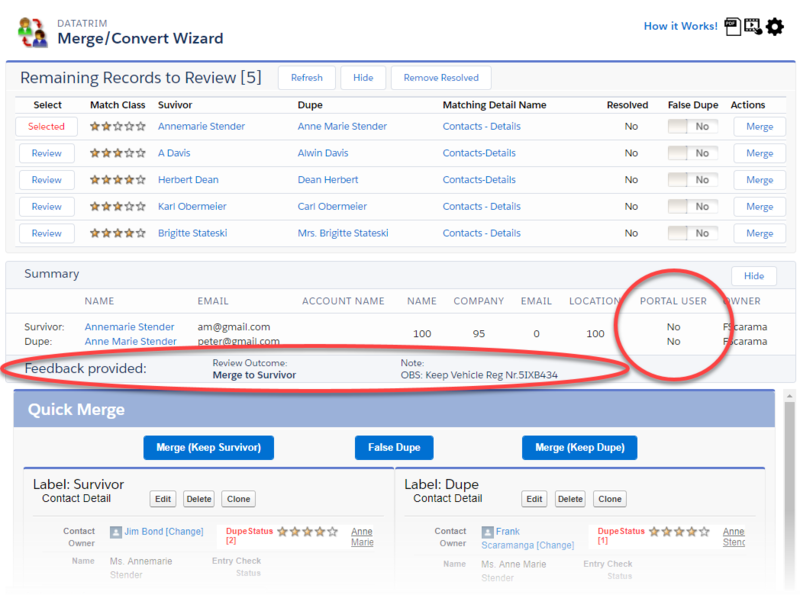 The Merge Wizard have been updated to include a summary section. This Summary section will sow you some basic scores, and important information about the 2 records being reviewed, e.g. is any of the 2 contacts is a portal user. The Summary section also displays any feedback provided by the end-user in a feedback process, so that the merge of the records can be performed accordingly. List View Buttons, are now included in the package. Buttons you can add to the List Views and Search layouts, giving your users the possibility to jump right into the Merge Wizard when ever they come across duplicates in their day-to-day work. Processing of large volumes of duplicates in Batch mode is now available with the DataTrim Matched Records Batch processing functionality. With a possibility to include up to 10.000 duplicated for each batch, deduping large database has never been easier. This functionality is currently in BETA. DataTrim Dupe Alerts App has been Lightning Ready for more than a year by now, but as you know the Lightning user interface continues to develop and expand, and so our App follows along. This means better and faster navigation, and leverage of as much of the native user interface as possible for our users, and available to all who has switched to Lightning, or is deploying a new org 100% based on Lightning. On the Matching side we have added new Advanced Parameters to the patching process, extending the suite of matching capabilities which has been available for salesforce clients for almost 10 years by now. A new parameter will allow you to use additional custom fields for the matching in combination with the list of fields already included by default. Check out the user guide for more details. Our client databases are getting bigger and bigger, and matching large datasets always pose a challenge when, as we do, all fields need to be compared and evaluated to give you the best possible match result. Our engineers are constantly improving the matching engine, which will allow you to get better and faster results without compromising the end result, and without you having to worry about match rules, fields to use etc. 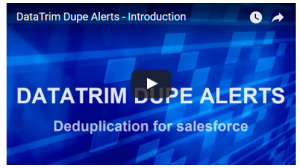 General availability: Marts 2018, a new version of DataTrim Dupe Alerts. Take the advantage of upgrading your existing version and benefit from the new features and bug fixes in this version. This is as no cost, it is part of yoru current subscription. © 2019 DataTrim - Your Data Laundry.